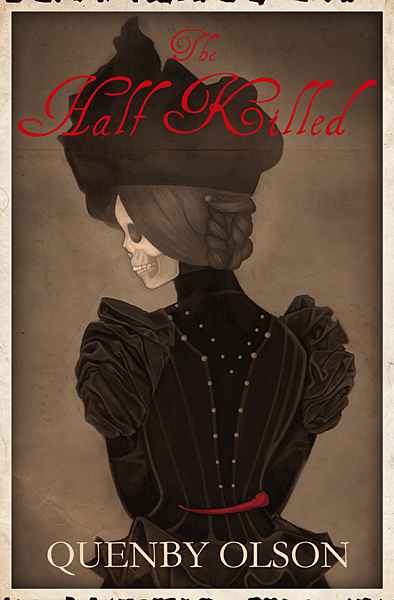 This Spring, I’ll be releasing my second novel, The Half Killed, a supernatural murder-mystery set in London at the end of the nineteenth century. Now, I don’t know when the idea of The Half Killed came to me. It started with a scene. And then another scene. And then another and another, until I had an entire world in front of me and a wider variety of characters than I could have ever anticipated. Of course, once I’d written several thousand words and a few chapters, I realized I needed to slow down and research and make sure I was happy with what I was producing. I didn’t mean to slow down to the point that it would take nearly a decade to finish the book, but there you go. This little scene was the first thing I wrote. I clearly remember sitting up very late at night (this was pre-marriage and children) and scribbling this whole thing down in a notebook, my hand cramping up as I reached the end of it but not wanting to stop for fear that the words would dribble out of my head before I could get them onto the page. At this point, my main character didn’t even have a name. (She’s Dorothea Hawes now, but she was simply Spiritualist Girl at the beginning). But from this bit grew another 90,000 words and 24 chapters. And even more stories for these characters to tell. The hush came quickly, as it always did. Even the coughing ceased, and I knew I had them. They would hold all of it in: the noises, the whispers—even the scratchings were postponed for a time, until the lights came up again and that aura of the mysterious lost its hold. When the curtain rose, a shudder passed through the crowd, hundreds of bodies moving forward, shifting for a better view. The immediate disappointment was an almost palpable thing. The stage was mostly bare but for a chair, a table, and a few other knick-knacks that wouldn’t serve any purpose as the evening progressed. But Marta insisted on them, claiming that a few baubles were necessary to entertain the eye. The edge of the curtain was my barrier, my point of no return. Behind the heavy fabric that smelled of dust and age, I tried not to give in to my curiosity, my head bowed as I assured myself that no one out there could hear the erratic palpitations inside my chest. The hiss of the gas jets was something of a comfort, and I exhaled through parted my lips as I closed my eyes and pretended—for a moment, at least—that the performance had already arrived at its end. The people would stand then, find their way back towards their homes, and I would escape to my room, if Marta allowed it. More often than not, there would be a private audience she would wish for me to entertain, and once again it would be long past midnight before I could stare out my window, until I could allow the voices to fade to a low buzz of whispering inside my head.